Welcome to Dunkin': Dunkin' Donuts Reveals New Brand Identity | Dunkin Brands, Inc.
CANTON, Mass., Sept. 25, 2018 /PRNewswire/ -- Dunkin' Donuts has been on a first-name basis with its fans long before the introduction of its iconic tagline, "America Runs on Dunkin','' with customers around the world naturally and affectionately referring to the brand as "Dunkin'." 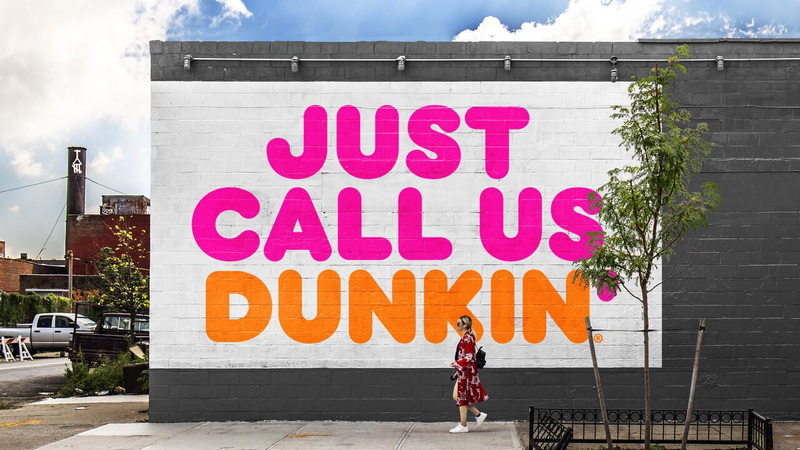 In recognition of this relationship, and as one of many steps to transform itself into the premier beverage-led, on-the-go brand, the company today unveiled its new branding at its Global Franchisee Convention that officially recognizes its name as simply "Dunkin'." The change will officially take place in January 2019. 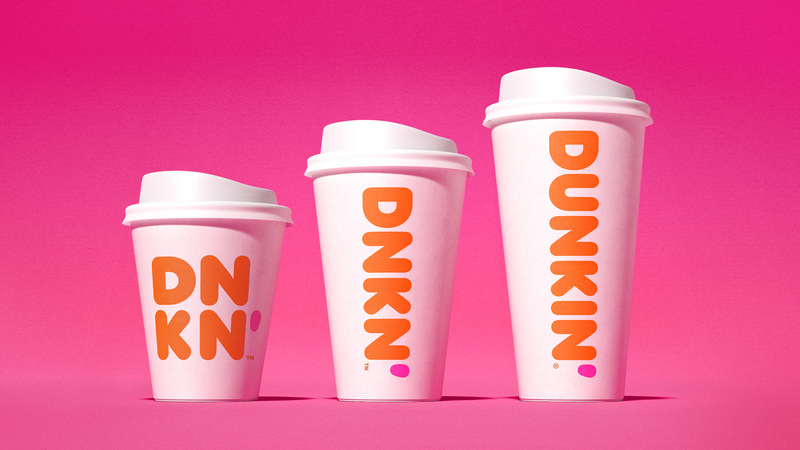 The new branding conveys the company's focus on serving great coffee fast, while embracing Dunkin's heritage by retaining its familiar pink and orange colors and iconic font, introduced in 1973. Beginning the first of the year, the new branding will appear on packaging, as well as the company's advertising, website and social channels. Going forward, the new "Dunkin'" logo will also be featured on exterior and interior signage on all new and remodeled stores in the U.S. and, eventually, internationally. 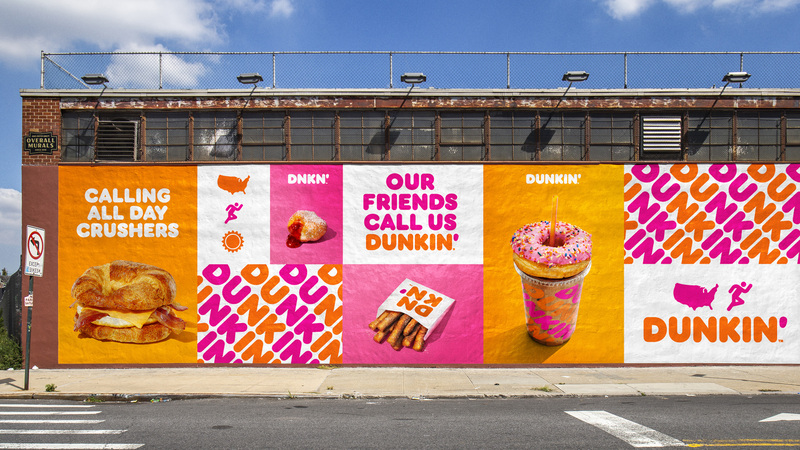 The brand tested the new logo extensively, including on exterior signage at Dunkin' locations featuring its next generation design concept over the past year. According to Dunkin' Brands' CEO and Dunkin' U.S. President David Hoffmann, "Our new branding is one of many things we are doing as part of our blueprint for growth to modernize the Dunkin' experience for our customers. From our next generation restaurants, to our menu innovation, on-the-go ordering and value offerings, all delivered at the speed of Dunkin', we are working to provide our guests with great beverages, delicious food and unparalleled convenience. We believe our efforts to transform Dunkin', while still embracing our incredible heritage, will keep our brand relevant for generations to come." "By simplifying and modernizing our name, while still paying homage to our heritage, we have an opportunity to create an incredible new energy for Dunkin', both in and outside our stores," said Tony Weisman, Chief Marketing Officer, Dunkin' U.S. "We are bringing the iconic name Dunkin' to the forefront in a bold way that brings to life how we refill optimism with each cup and bring fun, joy and delight to our customers each and every day." The new branding, developed in partnership with new creative and branding agencies Jones Knowles Ritchie (JKR), BBDO New York and Arc Worldwide, is one part of Dunkin's multi-faceted blueprint for growth, a plan designed to transform the company into the premier beverage-led, on-the-go brand. Recent initiatives have included a simplified menu, a greater emphasis on beverages like Cold Brew Coffee, Nitro Coffee and Iced Teas, the introduction of unique products like Donut Fries, an increasing emphasis on On-the-Go Mobile Ordering, and most importantly, the introduction of Dunkin's next generation design concept. Specifically designed to meet the needs and demands of today's on-the-go consumer, the next generation store design offers new and innovative elements to make running on Dunkin' faster and more convenient than ever before. The key in-store elements include an eight-headed tap system for cold beverages encouraging crew members to serve guests like bartenders, a glass bakery case putting donuts in the forefront within arm's reach of guests, and more prominent and engaging mobile-order pick up areas, as well as the first-ever mobile order drive-thru lane to allow mobile users to speed past the line. Although the word "donuts" will no longer appear in the logo or branding, donuts will remain a significant focus for the brand. As the #1 retailer of donuts in America, selling more than 2.9 billion donuts and MUNCHKINS® donut hole treats annually worldwide, each Dunkin' restaurant is required to make the most popular donuts available every day, along with local favorites, so that guests know they will be able to find the top-selling donuts and fun seasonal varieties no matter which Dunkin' location they visit. Earlier this season Dunkin' brought back its popular Pumpkin Donut and MUNCHKINS® donut hole treats for a sweet taste of fall. The brand will be revealing this year's lineup of Halloween-themed donut varieties early next month. The story of Dunkin' began in 1948 with a donut and coffee restaurant in Quincy, Massachusetts called "Open Kettle." Founder William Rosenberg served donuts for five cents and premium cups of coffee for ten cents. After a brainstorming session with his executives, Rosenberg renamed his restaurant "Dunkin' Donuts" in 1950. His goal was to "make and serve the freshest, most delicious coffee and donuts quickly and courteously in modern, well-merchandised stores," a philosophy which still holds true today. In 1955, the first Dunkin' Donuts franchise opened, and, in just 10 years, the number of restaurants had grown to over 100 shops. Since 1950, the number of Dunkin' restaurants has increased to more than 12,600 restaurants worldwide in 46 countries. For more information and images, please visit the Dunkin' press room at https://news.dunkindonuts.com.